The arms and ammunition market in Peru has exhibited a robust growth in the recent past. The rise in city crimes and illegal drug trade has caused the government to strengthen law enforcement agencies and military forces. The competitive landscape includes market players supplying arms and ammunition to Peru from all over the world. Factors such as cost, innovation and development, and ease of accessibility have been significant for gaining growth in the arms and ammunition market in Peru. Additionally, increased demand for small arms and ammunition for purposes such as hunting, and sporting is expected to drive the growth of small arms and ammunition during the forecast period. 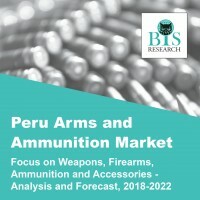 • This report identifies the arms and ammunition market in Peru across different categories such as military weapons, revolvers and pistols, firearms and similar devices, spring/gas guns or pistols, parts and accessories for weapons, bombs and grenades, and small caliber ammunition. • The report mentions about key market players for each category of arms and ammunition imported in the Peru market. Arms and ammunition is one of the prominent industries in Peru with customers in military, law enforcement agencies, and civilian and commercial markets such as hunting and shooting sports. The market landscape includes global companies offering products in arms and ammunition business by partnering with local dealers/distributors. Factors such as cost, innovation and development, and ease of accessibility have been significant for the growth of the domestic arms and ammunition market in Peru. The arms and ammunition market in Peru is anticipated to generate a revenue of $9.1 million by 2022. The demand for arms and ammunition is majorly attributed to the growing demand for weapons by civilians for self defense. Illegal drug trade and increasing domestic crimes are further expected to generate robust demand for arms and ammunition from law enforcement agencies and military in Peru.